In this chapter we will develop classes to represent playing cards, decks of cards, and poker hands. If you don’t play poker, you can read about it at wikipedia.org/wiki/Poker, but you don’t have to; I’ll tell you what you need to know for the exercises. If you are not familiar with Anglo-American playing cards, you can read about them at wikipedia.org/wiki/Playing_cards. There are fifty-two cards in a deck, each of which belongs to one of four suits and one of thirteen ranks. The suits are Spades, Hearts, Diamonds, and Clubs (in descending order in bridge). The ranks are Ace, 2, 3, 4, 5, 6, 7, 8, 9, 10, Jack, Queen, and King. Depending on the game that you are playing, an Ace may be higher than King or lower than 2. If we want to define a new object to represent a playing card, it is obvious what the attributes should be: rank and suit. It is not as obvious what type the attributes should be. One possibility is to use strings containing words like 'Spade' for suits and 'Queen' for ranks. One problem with this implementation is that it would not be easy to compare cards to see which had a higher rank or suit. An alternative is to use integers to encode the ranks and suits. In this context, “encode” means that we are going to define a mapping between numbers and suits, or between numbers and ranks. This kind of encoding is not meant to be a secret (that would be “encryption”). This code makes it easy to compare cards; because higher suits map to higher numbers, we can compare suits by comparing their codes. I am using the ↦ symbol to make it clear that these mappings are not part of the Python program. They are part of the program design, but they don’t appear explicitly in the code. """represents a standard playing card.""" As usual, the init method takes an optional parameter for each attribute. The default card is the 2 of Clubs. To create a Card, you call Card with the suit and rank of the card you want. Variables like suit_names and rank_names, which are defined inside a class but outside of any method, are called class attributes because they are associated with the class object Card. This term distinguishes them from variables like suit and rank, which are called instance attributes because they are associated with a particular instance. Both kinds of attribute are accessed using dot notation. For example, in __str__, self is a Card object, and self.rank is its rank. Similarly, Card is a class object, and Card.rank_names is a list of strings associated with the class. Every card has its own suit and rank, but there is only one copy of suit_names and rank_names. The first element of rank_names is None because there is no card with rank zero. By including None as a place-keeper, we get a mapping with the nice property that the index 2 maps to the string '2', and so on. To avoid this tweak, we could have used a dictionary instead of a list. Card is a class object, so it has type type. card1 has type Card. (To save space, I didn’t draw the contents of suit_names and rank_names). For built-in types, there are relational operators (<, >, ==, etc.) that compare values and determine when one is greater than, less than, or equal to another. For user-defined types, we can override the behavior of the built-in operators by providing a method named __cmp__. __cmp__ takes two parameters, self and other, and returns a positive number if the first object is greater, a negative number if the second object is greater, and 0 if they are equal to each other. The correct ordering for cards is not obvious. For example, which is better, the 3 of Clubs or the 2 of Diamonds? One has a higher rank, but the other has a higher suit. In order to compare cards, you have to decide whether rank or suit is more important. The answer might depend on what game you are playing, but to keep things simple, we’ll make the arbitrary choice that suit is more important, so all of the Spades outrank all of the Diamonds, and so on. The built-in function cmp has the same interface as the method __cmp__: it takes two values and returns a positive number if the first is larger, a negative number if the second is larger, and 0 if they are equal. Exercise 1 Write a __cmp__ method for Time objects. Hint: you can use tuple comparison, but you also might consider using integer subtraction. Now that we have Cards, the next step is to define Decks. Since a deck is made up of cards, it is natural for each Deck to contain a list of cards as an attribute. The easiest way to populate the deck is with a nested loop. The outer loop enumerates the suits from 0 to 3. The inner loop enumerates the ranks from 1 to 13. Each iteration creates a new Card with the current suit and rank, and appends it to self.cards. This method demonstrates an efficient way to accumulate a large string: building a list of strings and then using join. The built-in function str invokes the __str__ method on each card and returns the string representation. Even though the result appears on 52 lines, it is one long string that contains newlines. Since pop removes the last card in the list, we are dealing from the bottom of the deck. In real life bottom dealing is frowned upon1, but in this context it’s ok.
A method like this that uses another function without doing much real work is sometimes called a veneer. The metaphor comes from woodworking, where it is common to glue a thin layer of good quality wood to the surface of a cheaper piece of wood. In this case we are defining a “thin” method that expresses a list operation in terms that are appropriate for decks. Don’t forget to import random. Write a Deck method named sort that uses the list method sort to sort the cards in a Deck. sort uses the __cmp__ method we defined to determine sort order. It is called “inheritance” because the new class inherits the methods of the existing class. Extending this metaphor, the existing class is called the parent and the new class is called the child. As an example, let’s say we want a class to represent a “hand,” that is, the set of cards held by one player. A hand is similar to a deck: both are made up of a set of cards, and both require operations like adding and removing cards. A hand is also different from a deck; there are operations we want for hands that don’t make sense for a deck. For example, in poker we might compare two hands to see which one wins. In bridge, we might compute a score for a hand in order to make a bid. This relationship between classes—similar, but different—lends itself to inheritance. """represents a hand of playing cards"""
This definition indicates that Hand inherits from Deck; that means we can use methods like pop_card and add_card for Hands as well as Decks. Hand also inherits __init__ from Deck, but it doesn’t really do what we want: instead of populating the hand with 52 new cards, the init method for Hands should initialize cards with an empty list. move_cards takes two arguments, a Hand object and the number of cards to deal. It modifies both self and hand, and returns None. In some games, cards are moved from one hand to another, or from a hand back to the deck. You can use move_cards for any of these operations: self can be either a Deck or a Hand, and hand, despite the name, can also be a Deck. Exercise 3 Write a Deck method called deal_hands that takes two parameters, the number of hands and the number of cards per hand, and that creates new Hand objects, deals the appropriate number of cards per hand, and returns a list of Hand objects. Inheritance is a useful feature. Some programs that would be repetitive without inheritance can be written more elegantly with it. Inheritance can facilitate code reuse, since you can customize the behavior of parent classes without having to modify them. In some cases, the inheritance structure reflects the natural structure of the problem, which makes the program easier to understand. On the other hand, inheritance can make programs difficult to read. When a method is invoked, it is sometimes not clear where to find its definition. The relevant code may be scattered among several modules. Also, many of the things that can be done using inheritance can be done as well or better without it. So far we have seen stack diagrams, which show the state of a program, and object diagrams, which show the attributes of an object and their values. These diagrams represent a snapshot in the execution of a program, so they change as the program runs. They are also highly detailed; for some purposes, too detailed. A class diagram is a more abstract representation of the structure of a program. Instead of showing individual objects, it shows classes and the relationships between them. One class might depend on another in the sense that changes in one class would require changes in the other. A class diagram is a graphical representation of these relationships2. For example, this diagram shows the relationships between Card, Deck and Hand. The arrow with a hollow triangle head represents an IS-A relationship; in this case it indicates that Hand inherits from Deck. The standard arrow head represents a HAS-A relationship; in this case a Deck has references to Card objects. The star (*) near the arrow head is a multiplicity; it indicates how many Cards a Deck has. A multiplicity can be a simple number, like 52, a range, like 5..7 or a star, which indicates that a Deck can have any number of Cards. 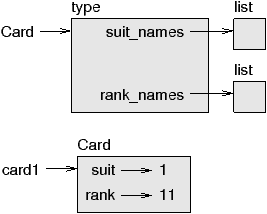 A more detailed diagram might show that a Deck actually contains a list of Cards, but built-in types like list and dict are usually not included in class diagrams. Exercise 4 Read TurtleWorld.py, World.py and Gui.py and draw a class diagram that shows the relationships among the classes defined there. Inheritance can make debugging a challenge because when you invoke a method on an object, you might not know which method will be invoked. Suppose you are writing a function that works with Hand objects. You would like it to work with all kinds of Hands, like PokerHands, BridgeHands, etc. If you invoke a method like shuffle, you might get the one defined in Deck, but if any of the subclasses override this method, you’ll get that version instead. Any time you are unsure about the flow of execution through your program, the simplest solution is to add print statements at the beginning of the relevant methods. If Deck.shuffle prints a message that says something like Running Deck.shuffle, then as the program runs it traces the flow of execution. So the shuffle method for this Hand is the one in Deck. Here’s a program design suggestion: whenever you override a method, the interface of the new method should be the same as the old. It should take the same parameters, return the same type, and obey the same preconditions and postconditions. If you obey this rule, you will find that any function designed to work with an instance of a superclass, like a Deck, will also work with instances of subclasses like a Hand or PokerHand. If you violate this rule, your code will collapse like (sorry) a house of cards. An attribute associated with a class object. Class attributes are defined inside a class definition but outside any method. An attribute associated with an instance of a class. A method or function that provides a different interface to another function without doing much computation. The relationship between a child class and its parent class. The relationship between two classes where instances of one class contain references to instances of the other. A diagram that shows the classes in a program and the relationships between them. A notation in a class diagram that shows, for a HAS-A relationship, how many references there are to instances of another class. The goal of these exercises is to estimate the probability of drawing these various hands. : A complete version of the Card, Deck and Hand classes in this chapter. : An incomplete implementation of a class that represents a poker hand, and some code that tests it. If you run PokerHand.py, it deals seven 7-card poker hands and checks to see if any of them contains a flush. Read this code carefully before you go on. Add methods to PokerHand.py named has_pair, has_twopair, etc. that return True or False according to whether or not the hand meets the relevant criteria. Your code should work correctly for “hands” that contain any number of cards (although 5 and 7 are the most common sizes). Write a method named classify that figures out the highest-value classification for a hand and sets the label attribute accordingly. For example, a 7-card hand might contain a flush and a pair; it should be labeled “flush”. When you are convinced that your classification methods are working, the next step is to estimate the probabilities of the various hands. Write a function in PokerHand.py that shuffles a deck of cards, divides it into hands, classifies the hands, and counts the number of times various classifications appear. Print a table of the classifications and their probabilities. Run your program with larger and larger numbers of hands until the output values converge to a reasonable degree of accuracy. Compare your results to the values at wikipedia.org/wiki/Hand_rankings. This exercise uses TurtleWorld from Chapter 4. You will write code that makes Turtles play tag. If you are not familiar with the rules of tag, see wikipedia.org/wiki/Tag_(game). Download thinkpython.com/code/Wobbler.py and run it. You should see a TurtleWorld with three Turtles. If you press the Run button, the Turtles wander at random. Read the code and make sure you understand how it works. The Wobbler class inherits from Turtle, which means that the Turtle methods lt, rt, fd and bk work on Wobblers. The step method gets invoked by TurtleWorld. It invokes steer, which turns the Turtle in the desired direction, wobble, which makes a random turn in proportion to the Turtle’s clumsiness, and move, which moves forward a few pixels, depending on the Turtle’s speed. Create a file named Tagger.py. Import everything from Wobbler, then define a class named Tagger that inherits from Wobbler. Call make_world passing the Tagger class object as an argument. Add a steer method to Tagger to override the one in Wobbler. As a starting place, write a version that always points the Turtle toward the origin. Hint: use the math function atan2 and the Turtle attributes x, y and heading. Modify steer so that the Turtles stay in bounds. For debugging, you might want to use the Step button, which invokes step once on each Turtle. Modify steer so that each Turtle points toward its nearest neighbor. Hint: Turtles have an attribute, world, that is a reference to the TurtleWorld they live in, and the TurtleWorld has an attribute, animals, that is a list of all Turtles in the world. Modify steer so the Turtles play tag. You can add methods to Tagger and you can override steer and __init__, but you may not modify or override step, wobble or move. Also, steer is allowed to change the heading of the Turtle but not the position. Adjust the rules and your steer method for good quality play; for example, it should be possible for the slow Turtle to tag the faster Turtles eventually. You can get my solution from thinkpython.com/code/Tagger.py. The diagrams I am using here are similar to UML (see wikipedia.org/wiki/Unified_Modeling_Language), with a few simplifications.